Happy Black History Month! In the UK, October is a month to remember, reflect and celebrate the achievements and experiences of black people. With this in mind, I wanted to include a very small selection of the incredible black women who have made, and are continuing to create, a wealth of diverse and exceptional music. Never forget that it was a black woman – Sister Rosetta Tharpe – who created rock’n’roll, not Elvis. Princess Nokia also appeared in conversation at Brown University as part of their Women’s History series, the entirety of which you can watch here. Amongst other things, she discusses religion, identity, spirituality, gender, heritage and how feminism is “a birth right”. Credit to her for going into such a traditionally exclusive environment and being honest and real. Read more about her here. Despite working primarily in the 1980s and 1990s, Whitney Houston remains one of the best selling musical artists of all time. At the beginning of her musical career, she was also one of the first women of colour to grace the cover of the popular American magazine Seventeen. Houston was the first African-American woman to secure heavy rotation on MTV, opening up her work, and black music more generally, to a wider audience and has been cited as a major influence on artists such as Mariah Carey, Beyoncé, Alicia Keys, Britney Spears and Ariana Grande. More recently, the renowned documentarian Nick Broomfield released Whitney: Can I Be Me, which uses archive footage to look at her life and tragic death at the age of 48 in 2012. Trying to pick just one track from Santigold’s landmark self-titled 2008 debut is nigh on impossible. If you haven’t listened to it already, check it out ASAP. You’re in for a treat. I was lucky enough to chat with Eno Williams from Ibibio Sound Machine last year about her musical influences and inspirations. Check out my interview here. On a more serious note, I’ve included Billie Holiday’s classic ‘Strange Fruit’ who first sang and recorded it in 1939. The song was actually written by a white, Jewish high school teacher from the Bronx named Abel Meeropol, who had written it “as a protest poem, exposing American racism, particularly the lynching of African Americans.” This song never fails to give me chills – and so it should. While we celebrate the work and achievements of black people, we need to stay focused on how much work there is still to do. In the last few months alone, we’ve seen one person dead and many injured after white supremacist riots in Charlottesville, the first far-right party (AfD) winning a seat in German parliament in nearly 60 years, Piers Morgan arguing that white people should be able to say the “N-word” and Trump looking the other way while people of colour’s lives are decimated following a lack of funding and support following natural disasters. We cannot be complacent. These are issues affecting people 365 days a year. I also wanted to draw attention to this short film made by Imkaan and End Violence Against Women which features young BAME women talking about their experiences of sexual harassment in public places and how it is often combined with racism. The image at the top of the page is the album cover for Whitney Houston’s self-titled debut album, released in 1985. 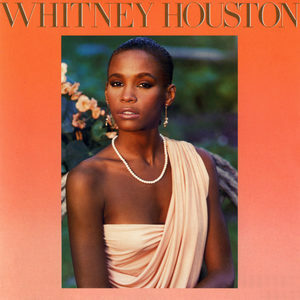 The picture of Whitney is an upper-body shot of her wearing a a draped peach dress, a pearl necklace and her hair pulled back from her face. She appears to be in a garden and the photograph is surrounded by an orange border. She looks like an absolute goddess. The first video – ‘Tomboy’ by Princess Nokia – shows Princess Nokia and her pals strutting around her local neighbourhood, such as the basketball court, what appears to be her living room and smoking in the stairway of her housing block. Nokia and her crew ride around in a car, kick a ball about, skateboard and generally have fun with each other. She has so much swagger, it’s amazing, and all her mates look like people you would definitely wanna be friends with. 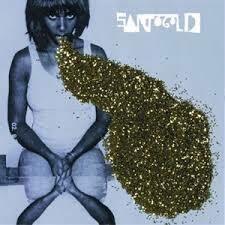 The second image is the album cover of Santigold’s self-titled debut album. It shows Santigold seated at what appears to be a mirrored table. She wears a white vest and has her hands between her thighs. Her chin is slightly dropped, but she is looking up at the camera behind her thick black fringe and shoulder-length hair. From her mouth, a large area that resembles a speech bubble has been covered and filled with gold glitter. The second video at the bottom of the page features interviews with a range of BAME women, who are talking about their experiences of sexual harassment and racism, interspersed with classic shots of London, such as Piccadilly Circus and Big Ben from across the Thames. It’s a powerful film. All images shared under a Creative Commons licence.